Central banks are leery of the newly arrived Chinese yuan. Over the decades, there have been a number of efforts to deflate the dollar’s hegemony as a global reserve currency, which it has maintained since World War II. Some of these efforts – such as the creation of the euro – have made a visible dent into the dollar’s status. Other efforts have essentially passed unnoticed. Now there’s a new contender: the Chinese yuan. On December 31, the IMF released its report on the Currency Composition of Official Foreign Exchange Reserves (COFER) for Q3 2017. So how has the US dollar fared as the top world reserve currency, now that the Chinese yuan has also been anointed as one, and that the euro has emerged from its debt crisis? First things, first. The IMF doesn’t really disclose all that much. The COFER data for the individual countries – the level of their reserve currencies and how they allocate them – is “strictly confidential,” it says. So what we get to look at is the global allocation by currency. Not all central banks disclose to the IMF how their foreign exchange reserves are allocated. In Q3 2017, 14.6% of the reserves hadn’t been allocated. But this number is plunging. In Q3 2014, just three years ago, it was still 41.2%. This means that more and more central banks report to the IMF their allocation of foreign exchange reserves, and the COFER is getting broader. US dollar: 63.5% share, down from 64.6% in Q3 2014. Euro: 20% share, down from 22.6% in Q3 2014. Yen: 4.5% share, up from 3.6% in Q3 2014. Pound Sterling: 4.5% share, up from 3.75% in Q3 2014. The Australian and Canadian dollars had a share of 1.8% and 2.0% respectively. The Chinese yuan – that thin red sliver in the chart below – had a share of 1.1%, up from 1.08% in the prior three quarters, and up from zero before then. The Swiss franc, the hair-fine black line in the chart below, has a share of 0.2%. And a number of “other” currencies have a combined share of 2.4%. The Chinese yuan made its entry after IMF boss Christine Lagarde and the IMF staff declared in mid-November 2015 that they were gung-ho about adding it to the IMF’s currency basket, the Special Drawing Rights (SDR), which is an important step toward becoming a major global reserve currency. At the end of November 2015, it was approved by the board. And it took effect in October 2016. Sure enough, in Q4 2016, the Chinese yuan started showing up in the COFER data as a global reserve currency with a share of 1.08%. But rather than soaring, it didn’t move at all over the first two quarters in 2017. And in Q3, it ticked up to a still minuscule 1.1%. Central banks do not appear to be overeager to hold this currency in large amounts. The chart below shows the changes since Q3 2014. The black line at the top is the US dollar – its hegemony unbroken. The euro (blue line) has remained fairly stable around 20%. 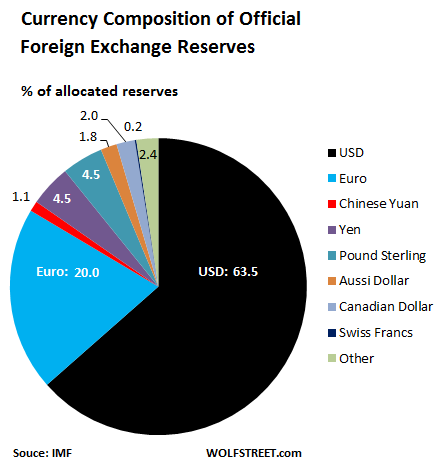 The dollar and euro combined account for 83.5% of the allocated foreign exchange reserves. That doesn’t leave much room for other currencies. 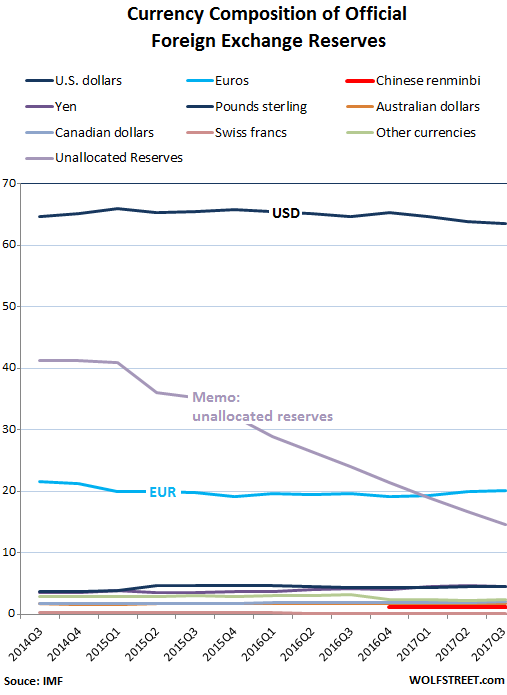 As a memo entry (not part of the percentages): The descending purple line denotes the shrinking unallocated reserves. While the euro has become a major force, it has replaced the Deutsche mark and other European currencies, and so the net impact on the dollar’s hegemony wasn’t huge. The Chinese yuan, which some folks thought would pull the rug out from under the dollar, is barely visible in the mix. And folks eagerly waiting for the “death of the dollar,” the “end of the dollar hegemony,” and similar mayhem will need to be patient. Same to you , Wolf. Looking forward to your 2018 posts. you are awesome sauce. stay blessed and have a fun abundant 2018. Haooy New Year! Thanks for a year of solid informative posts. Happy New Year for Wolf too. Keep up the great work on the charts and data! My take on USD is really simple. All currency pairs by default are relative measures. Therefore, the “strength” /”weakness” of a particular currency versus another one is merely a reflection of the relative economic dominance of their respective countries. In other words, a weak economy can still have a comparatively strong dollar, if all the other countries are worse off. China or any other Asian country is NOT going to lead the world economy any time soon, if ever again. Their (China) growth volumes may be eye-watering in absolute terms now but many of these Asian countries cannot lead in any of the technical innovations as well as political re-inventions required for world leadership. Asian countries make great partners as sub-contractors and hardworking manufacturers (e.g. Taiwan, Japan, Singapore, South Korea etc.) but don’t worry, they are not going to rule the world with their very restricted worldview and socially-constrained hierarchies. I have lived and worked in many Asian countries and at risk of sounding racist, I can tell you Asian mindsets, their social milieu and education system forbids any real divergence and/or great innovations. Look at ALL the great technological inventions of the last few centuries: from Wright brothers to mobile phones to quantum computing. Which names were LEADING all the scientific and social movements? Mostly those of Western origins. Taiwan? Yes, they are great sub-contractors to Apple, but so far have their local Taiwan branding dominated the world markets? Anyone heard of HTC? Look at Japan, yes great cars and consumer electronics, but yet they DIDN’T popularize electric cars and lead the world industry a new direction the way Tesla single-handedly did. Look at China, yes they invented the compass, but yet they were not the first to circumnavigate the globe and give humanity a new and broader worldview. Western societies can be crazy at times, but they often allow great latitude to brilliant minds like Einstein, Edison, Tesla etc. to flourish and produce great works of Science, Art and even political change, which in turns, creates great technical and social innovations. Eastern mindsets are about following the crowd, keeping the status quo and NOT sticking out as a sore thumb. Eastern societies suppresses their brilliant minds and innovations with ostracism, social disapproval and even political threats. They are mostly not interested in leadership. They will follow USA to the moon or to Mars, but they will not be the FIRST to go there, because it never occurs to them to break the comfortable mold, in thinking, in living or in their perspective. I can run so may other examples, but the point is, many Asian countries are constrained by their own repressive socio-cultural mindset and self-imposed strict hierarchy of social order. Hence, their minds cannot “think out of their literal boxes”. They can only follow the existing paradigm that they were born into and which their society trained and coerced them into. Long story short, is that US economy is still the world’s most open-minded, innovative and productive, and hence USD dominance as the reserve currency of the world will stand. I am not an American but this is so clear for me from an independent observer viewpoint. I agree with everything you said. But here are the two crucial concepts. “State” and “Trajectory”. In terms of “state” which is an accumulation of all the things happened in the past, WEST still has all the advantages and good properties comparing to EAST. But “trajectory” wise, west is getting more and more central controlled, less and less freedom. The east is getting less central control and more freedom. People tend to pay attention to “state” because it is easy to see and compare. What is hidden and difficult to perceive is the trajectory. To me the fundamental driver of a nation’s prosperity is the freedom of its people. US “WAS” great because it “WAS” the land of the free. Now it is less free although still ahead of the EAST. But you have to pay attention to the “trajectory”. What you have to watch is the TRUE rule of law. Nobody. Not even a Sexual assaulting, or corrupt (like the current one) POTUS is above it. Currently. Russia, iran, china ,DPRK, do not have this. They have, “whim of the Boss (Boss Clan)”, and “Political Considerations”. They may come to be the Globally Dominant states but Never with the free consensus of the “Advanced Rule of Law States” . You can not do business, or have a life, stably and securely, in such states. That’s the difference. @JZ, yes, I see your point. So the question is trajectory-wise, is USA going to be reduced to a state with less freedom and worse than say China in the near future? I really doubt so. If China (or any other Asian country) ever allows citizen gun rights the way USA does with their hallowed NRA and their 2nd Amendment; then perhaps I would be willing to bet on Chinese Yuan. How likely do you think that will happen? lol. Despite all the sadness and madness, USA trajectory is still on track to continue as the leader of the free world. If USA does fall, my bet is another free Western nation will take the leadership mantle (perhaps the Swiss with their similar citizen gun rights) or the Dutch. Ability to innovate is enabled by individual freedoms. Freedom to innovate and democratize it to wrought technological and social change. Without freedom, even Giordano Bruno can be burned at the stake for suggesting that the Earth revolves around the Sun. Without freedom and the means to enforce it, all ideas die and hence all innovations with it. Thus, it is NOT remotely likely going to be any Asian country that will be leading the Free world; simply because as I have emphasized, Asian cultures sees things from a totally different angle. Behind the veneer of stability and progress, China and many other Asian countries such as Japan, Taiwan, Singapore, Koreans, Vietnam, etc. have a LOT of problems, socially, economically and politically too. Their trajectory looks shinier on the outside only because they place heavy emphasis on managing appearances (especially to outsiders) and “saving face” regardless of reality. Its their version of keeping up with the Joneses, except theirs is ingrained into their collective consciousness over thousands of years. Asian mindsets is about individual suppression & social pecking order above all else… not adaptation, human development and democratizing innovation. Understandably, what little real innovation that originates in Asian countries tends to be thwarted by their over-glorified State machinery (and their respective political leaders) into systems for ever more control and suppression of their society. That trajectory has been going on in their culture for thousands of years and it is not going to change easily or anytime soon. Thus,, my bet is still on USD for the forseeable future. If you have any Asian friends, ask them subtly on the above to check the veracity of my points above. @Sammy, blockchain technology is radical, but nice try on your quasi-question / semi-statement that it was “supposedly” a creation by a Japanese….close but still no cigar. Satoshi Nakamoto is a pseudonym. Thus far, the closest that anyone can prove he was the creator is this Australian guy who does seem to have had the original keys. Until the creator can be definitively identified, there is nothing to account for based on mere suppositions. Factually, Australia is also a pretty free country with a largely Western cultural heritage….There… I rest my case. PS: I don’t suggest buying AuD though… her economy has little momentum going except mining, tourism (including a market for foreign Asian students) and property speculation. lol. Why unless you are insane would you follow the US it is not even a “Real” Democracy. It is a Duopoly owned by the Globalised Vampire Corporates.. The are plenty of other still vaguely free systems out there, that are a lot more democratic than the US. That would again quickly become freer if the terrorism elements from the Greater MENA “Mostly iranian sponsored” were neutralised. @JZ, I’m not sure if I fully understand your comment, but I agree that Americans’ knack for derring-do has been reckless of late, especially with their military forays in the middle east. Geo-politically, I don’t see any reasons why US still wants to retain a military presence in the Mid East, when they now can produce more oil than Saudi Arabia. Further, the WMD were non-existent in Iraq, and Iran’s nuclear program has been heavily set back by Mosad in collaboration with the US. There is also nothing much left in Afghanistan. The only perceived “threat” is Russian encroachment into the region which had already once failed miserably back in the 90s and which in all likelihood is quite pointless anyway. Let them Russians mess with the jihadist hiding in caves all they want, I really don’t understand why America is fighting all these unnecessary wars and wasting herself for very little economic or geo-political gains. I agree America has not been a good role model over the recent years, so yes, as I’ve indicated, other Western nations might takeover the leadership mantle should the US fracture internally. I can’t foretell the future, but as I look at their current social dynamics, a second American civil war is a very distant possibility; So far, I still think US resilience will surprise on the upside, so my bets are with US economy leading the industrialized world in terms of productivity and innovation. No other country comes close yet, and should that ever begin to change materially, then you’ll just have to shift your USD holdings to something else. Can there be a more grotesque insanity than to pretend that Western societies are not ‘societies of control’? Ask the two million plus locked up in the US prison industrial complex, with millions more on parole, released but stripped of voting rights or otherwise ‘controlled’. Perhaps the ‘control’ of the highly oligopolised MSM also illustrates the culture of control in the West, too, as does the current campaign to purge the Internet of Thought Crime. And then there is the control of ever stagnating wages for the proles, the refusal to allow unionism, and the mountains of debt required to continue to ‘enjoy’ the American Dream. Countless other examples of control in the West abound, although the rich, that gilded 1 to 10%, do enjoy rather more autonomy. Your comments could’ve been written by the British in 1775. Kevin, a very clear exposition of ‘Orientalist’ racism, and delusions of Western civilizational supremacism. What a pity that those ‘Yellow Devils’ are not listening. Spell check accept Deutche? Mine don’t. Thanks also for deciding to buy Big Like and venturing online to do so. A little story: Several guys at my swim club bought the paperback, but one of them, after finishing it, handed it around along with a strong recommendation. That was a year ago. Now the somewhat tattered copy is still getting handed from one guy to the next, and I hear the comments from them — and who got it next — in the sauna where we warm up after our swim in the Bay. The euro’s strength is only because in spite of all the basket cases it drags along, the German economy anchors it. If, as many predict, the Euro-zone fractures, and Germany returns to the D-Mark,the US dollar becomes a second tier currency. The traditional party of balanced budgets in the US seems to have lost interest in the topic, and having just spent 1.5 trillion in a tax cut, now wants to do infrastructure, including no doubt The WALL. The attitude of the head of the Executive towards debt is too well known to need comment. The very conservative attitude towards debt at the consumer level and the government level in Germany is pretty much the opposite. The euro, backed by debt monetization and negative rates, no problem with the ECB turning it up from 11 to 12 or more. It’s all free money to them, financed by everyone who will accept or must accept a euro. Don’t worry … they’ll print more. The yuan, backed by ponzi wealth funds, empty cities, and autocratic rule when needed. The line starts here. The Swiss Franc, backed by equities purchased with printed money. They’ll even buy gold with printed money if anyone will accept it. Wish I could do that with a basement printing press. Nigerian currency … backed by chain letters, aka real money if enough solicitation letters go out. The dollar – probably OK if normalization continues and people ultimately understand the scam of Bernanke/Yellen and how they tried to kill savings, investment from savings, and interest income and replace it with printed money, low to possibly negative rates, and asset inflation. Pick your poison. None of the above are very sanitary, although the dollar and the Nigerian currency are at the top. Amen as to what PPP says. It is amusing that our very poor financial circumstances are still better, at least in the eyes of investors, than the negative-interest-rate euro and other currencies. However, I wonder how long that can last. Our national debts (and undisclosed liabilities) are truly enormous in relation to our GDP and we have a foolish leader backed by a corrupt congress that have abandoned all pretense of fiscal conservatism: their latest tax “reform” is essentially a give away to buy votes. They are like foolish people who have gotten too many credit cards spending without limit and are headed for their ultimate bankruptcy. Sooner or later, given the unfunded, rarely disclosed liabilities (e.g., due to the aging population and ongoing retirement of baby boomers) will overwhelm the federal budget. The reduction of the tax revenues that Trump has caused will accelerate that time. (That was in 2014.) Other countries total debts plus liabilities are not as enormous. The Federal Reserve bank cartel and the U.S. governments have been playing a balancing act for years, maybe even covertly destabilizing other governments to keep U.S. dollar reserve status. However, I think that the end of that road is visible. I cannot predict when it will come, but if the other currencies are too weak or unreliable, investors will flee to commodities, like gold, platinum, silver, art, etc., or other asset classes. Probably, it will be a mix of all of those, since the amount of dollar reserves is still huge. It is a good thing that we still produce food, so hopefully, we will not starve if the dollar gets rejected as a reserve currency in some future year. The fact that oil is already being traded in currencies/commodities other than the dollar signals the end of that reserve currency status: when oil producers and other producers start to decline the U.S. dollars for payments, other countries will no longer keep their funds in U.S. dollars. The Saudis may be already upset enough with the U.S. that they may risk annoying our government (like Sadam Hussein and Muammar Gaddafi) and refusing payment in U.S. dollars in some future year. Letting people keep their own money (private property) is not buying votes. Buying votes is when you take one person’s money and give it to another person. That also qualifies as theft. We don’t have an income problem, we have a spending problem. The federal budget consumed 22% of GDP in 2017. I suspect that will get worse as both parties want a massive infrastructure bill. This massive debt that we have started with Bush. But while most people cite Iraq and Afghanistan, the largest share of debt came from his domestic spending. Under Obama the debt was worse, and the trajectory to service the debt became mind-boggling. Before the election, the CBO projected the costs to service the debt will equal what we spend on defense in about decade. When I saw this testimony, I wondered why anyone would want to run for office. Dollar will continue to strengthen until countries realize that dollar funding is the road to death. Then they will simply abandon the dollar – because they have to. Look at all the nonsense they resort to, draining their foreign reserves in the process. Cannot continue. – Happy New Year !!! – It’s “Deutsche Mark”. You forgot the “s”. – The USD being the most prominent currency is a FUNCTION of the US running Current Account Deficits (CADs) since say – at least – 1983. – Since 1983 34 years have gone by. And in those 34 years the US has been running CADs for 33 years. 1990 was the last year when the US ran a (small) Current Account Surplus (CAS). And that waqs a year in which the US was in a recesssion (hint, hint). – If the US would start running a CAS from now on in each of the next 10 years then in each of those 10 years the size of USD reserves will shrink. – The Eurozone as a whole is running a Current Account surplus but there’re a number of Eurozone countries that run a CAD. 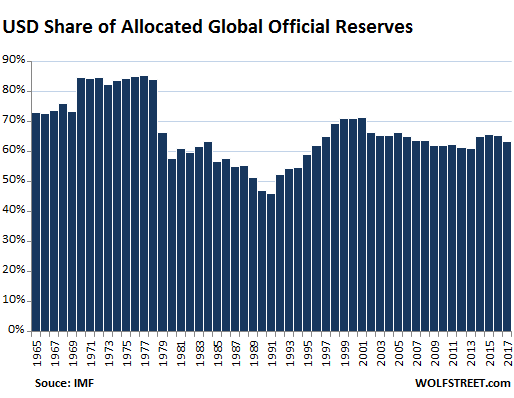 Hence the – IMO surprisingly – large share of currency reserves in Euros (~ 20%). – And the US running CADs is a FUNCTION of the Petro-Dollar. – If from today all commodities were to be traded in Euros then the CAD and the CAS would swap places between the Eurozone and the US economy. And a switch from a CAD to a CAS (for the US) would have meant a DEEP DEEP recession for the US. – ONE reason the US invaded Iraq in 2003 was the fact that Iraq/Saddam Hoessein from october 2000 onwards only accepted Euros for iraqi oil. The US HAD to act, the danger of US financial meltdown was simply too large. Currencies trade relative to other currencies. The yuan is pegged, yes, pegged, bought and sold by the Bank of China everyday to maintain it’s tiny little hand into the big mitt of the USD. Whether by default or by design, the USD is going to be the cleanest dirty shirt for a long, long time to come. If the USD fails, it will fail through inflation as all other currencies will also. CCP china and Chinese people are different things. Chinese business men LOVE the FED. The way it is structured the US govt can default and the FED so the $ remain Stable and Strong. The FED can Fail whilst the US Govt remains solvent. The FED is not the evil the Loonies portray it as, direct political control will change that. When the US economy gets to be around 15 Th in the world GDP per capita and the majority of Global Majors do not have offices in The US. The US $ reserve status may come into question. By then Tax havens will probably be on the Moon or Mars. Also most of the world would love to move to the US if they could, henxe the massive counts of legal and illegal immigrants. Rich Chinese women are giving births to US citizens in Saipan (visa free) or East Los Angeles – so that gives you their faith index in their own country. What ‘good’ has the USA done in the world, exactly? The word “billion” should be changed to “trillion”. The fist of 2018 is yet to be inserted. 1. Regardless of how broken or bent or fractured the US economy might look, how toxic the Wall Street money-shuffling is, how bad of a policy the FED and the WH have or might have had, truth is… the USA has shown a fairly steady and consistent economic and military output over the last 70 years, giving confidence to the dollar. 2. I don’t see a demise of the dollar anytime soon, I am more concerned about the economy in general. A good example is the UK, the Pound is still around, but “UK industry has left the building” a long time ago. A currency can outlive it’s creator. Good observation. To follow your point, it is likely the dollar will be around, as a diminishing force but still a significant force, for a couple of centuries beyond the final hollowing out of American industrial power. Like the English Pound as you say. To add to your point, the dollar, once backed by gold and now nominally backed by oil, is really backed by American Military might and its victor’s control of international banking. The IMF, the World Bank, but most of all (IMO) SWIFT. It will take a lot for America’s competitors to replace the depth of the T-Bill infrastructure and the utility of the SWIFT system. They will get there but it won’t be fast, and it definitely won’t be easy. Thanks for the link. Good read. My take is the U.S. has been a dominant trading partner because it’s wealthy citizens could tap their relative wealth and buy lots of goods from around the world. Now that the U.S. is indebted up to its eyebrows, the U.S. has lost its purchasing power and will cease to be a dominant trading partner. The U.S. no longer has wealth to purchase goods, and it has little manufacturing capacity to produce goods. In addition, any remaining purchasing power has shifted to 1% of its citizens who are all standing on one side of the boat. It’s game over, until the day when debt is reduced and wealth is fairly dispersed to those who work for it. Robert, thanks for the nice read. I will have to go through this a few times, couldn’t catch all the details in the first flight. Though all your points are valid, we sometimes get lost in the numbers. The demise of the economy is , in my humble opinion, strongly driven by the juridical and in general legal impotence in respect to shady and questionable business practices. It doesn’t matter how good your solutions are if the system is working against itself…breaking the first law of nature…self preservation. The chinese bullied the IMF into accepting the CNY into the SDR. The chinese are forcing many small Nations that can not afford to fight back to trade in CNY. What the chinese or anybody else, can not do, is force a consensus on the Global Economy, of which currency to use as its major reserve. When a consensus is arrived at, there will be a shift. The chances of the US $ being undermined the way Sterling was by two world wars and the Marshall plan is unlikely in the near or medium future, no matter what china does or says. Happy new year, many more to you! My prediction for the next five years: The US Dollar will remain the most used “Global Reserve Currency” it’s percentage of use will be going lower while others will go higher. If the Euro can go past it’s Brexit aftereffects and sinking banks and China tightening up is somewhat successfull, then both the Euro and yuan might be good long term investments then again nothing is sure. Just buy gold if you want something safer. I think the long-term picture is the key point to going forward, the USD hegemony will go for many years to come until it breaks/unsustainable. Economies that are positioned to have a long-term plan in the future, like China has to wait for the right time for the USD to fail and then the Chinese may step in without being seen as the threat but rather seen as the solution, like in 1920’s with the US. In other words, I believe CBs haven’t learn much about financial history, as they keep making the same mistakes and they cannot be accountable for. As long as they are not held accountable, they will rip you off, and it is no mistake. Remember: this nation of sheep has stood by while the banks which own the CB’s have gotten away with fleecing them out of trillions, virtually interest-free, to the extent that new debt could be loaded on their donkey-like backs, and in so doing, justify paying savers virtually nothing. I’d call that criminal genius, and you think they are “mistaken”? The entire S&L Scandal was a similar fleecing, as it was the taxpayers who were on the hook for fraudulent lending, and it was again the taxpayers who took it in the neck for AIG, CITI, Goldman and the rest through TARP and QE. Above, the yuan is derided as “toilet paper”, but at least the Chinese people have seen an amazing rise in their standard of living, ebenm as the middle class was crucified in Europe and America, and as long as there are no restraints to expansion of national debt elsewhere, why would China rein in expansion of their own debt? If America’s major trading partners stopped piling up dollar assets, the dollar would tank, and they’d lose a major export market. It’s an extortion racket. I wonder how much the dollar is anchored by the sheer number available in the world, making them easy to trade, as well as the amount of world debt owed to American banks. The decline of American manufacturing has been picked up by our Chinese friends. And they have been kind enough to anchor their currency based on ours. And a happy and prosperous year to you too Wolf. Over the last couple of years, this has become my favorite web site to visit. Ditto, Kent. Thank you, Wolf, for your excellent website and the ongoing research you share. And “Thank you” to the commentators/contributors who remain civil and candid in their replies. Happy New Year, y’all. I certainly agree with nicko2! I’ve learned a lot on this site over the past year from both Wolf and the commenters. Thank you and Happy New Year!! The dollar will remain the global currency because only the US. is willing to accept large trade deficits. The Euro, or German Mark, if it comes to that, will never become a major player because Germany will never allow that, or China, Japan and almost every other country in the world. If you want to export at all costs, you play by American rules, it’s as simple as that. And have a happy new year too! Thanks for the great website. You called it but did not name it. The issuer of the world’s reserve currency MUST RUN LARGE TRADE DEFICITS. Otherwise there won’t be enough of the reserve currency extant to lubricate international trade settlement. It’s called “Triffin’s Dilemma” . BTW, one major point that falls out of Triffin’s Dilemma is that all this talk about bringing the USA international balance of payments into balance is just silly talk — as long as the US dollar remains as the world reserve currency. I think I get Triffin’s Paradox. Yet at some point there will be a straw that breaks the camels back. If you look at the total debt issued that in and of itself is a parabolic curve. Hugo Salinas Price is of the opinion that we hyper-inflate the currency back to a gold standard. The euro is the second largest reserve currency with a share of 20%, but the Eurozone has been running a significant trade SURPLUS with the rest of the world (€188 billion for the first 10 months in 2017). So tying reserve currency status to trade deficits is not so straightforward. Still, I’d break it down country by country in the Eurozone as is done in the chart, in your link. There’s Germany, then there are a few other large countries, then there are the remaining small countries. Germany’s surplus is the locomotive on that “Euro-train” . Yet your point is still completely correct. However you neglect to mention that the USA trade deficit is everlastingly huge, and thus the other — AND MINOR — world reserve currencies need not run deficits as described by Triffin’s Dilemma. And I am remiss in this thread — for not thanking you for your “beyond superior” site, for fabulous commentary by good people, and for what you teach me day by day by day. Most days I do not comment, but on all days I learn a lot ! Really, A LOT ! ! ! No country can afford to have gigantic trade deficits for decades UNLESS its currency is a large reserve currency that other countries hoard no matter what. The USD’s status as the top reserve currency may have thus ENABLED the US to run these deficits. 1. The currency of any large economy with a freely convertible relatively stable currency could become a large reserve currency (see euro). 2. But no economy can run huge trade deficits for decades unless its currency is a major reserve currency. 3. If the USD loses its status as the top reserve currency, it will no longer enable the US to run these trade deficits, which will likely run into an economic and financial brick wall, and something will give (currency devaluation, credit collapse, or something of that nature). This would cause imports to dive hard, thus bringing the US trade deficits down, and cause major economic upheaval both in the US and among exporting countries. But I don’t see this scenario anytime soon. Like I said before: I learn a lot. Though provoking response. Worthy of careful consideration. It makes nice sense, and weakens part of the foundation of the Triffin Dilemma. As the Great Vulcan once said ( my final benediction in 2018 ), to you Wolf and to all WolfStreeters too : Live long and prosper. What could be better than that ? – The yuan becoming the “Reserve Currency” (any time soon) ???? To achieve that China must start to run (large) Current Account Deficits (and Trade Deficits) for a long, long time (like the US). – It’s similar to what happened to the yen. Japan has been running (large) Current Account Surplusses (= Trade Surplusses ) for a long time. Hence the very small % of foreign reserves that are denominated in yen. The only thing that stops CHF becoming the reserve currency, is that you can not get enough of it at a GOOD price. The no 1 pair of concern for any reserve. Are: Stability and Trust. 1866 dollar bill’s are still accepted. So are 1866 pound notes honored, if you take them to the Bank of England. 1866 Gold/Silver Coins, have grater value than face. The Statistics from the State and PBOC are “Opaque” to put it mildly. There is no guarantee. The Tomorrow the PBOC does not issue. Blue chairman Mao’s ( or Chairman Xi’s) with One or Two less Zero’s and knock’s One or Two Zero’s off of everybody’s Bank and Bond account’s. Cancelling all the Red chairman Mao’s in Circulation. Without warning. Such a State Where “Politics’s” Rule over law. Can never be “The” Reserve Currency. Hence for CNY to attain that title, much must change in china. – E.g. between 2001 and 2014 Southern Europe also ran CADs (and Trade Deficits) and NOT only with other countries in the Eurozone. But also with countries outside the Eurozone. Hence the outflow of Euros to the rest of the world. – Oh yes. Foreign currecy reserve status do cause those US CADs. But the reasons why is not so simple. – As time went by the US military footprint increased outside the US and that also leads to a increased flow of USD to the rest of the world and growing USD reserves outside the US. I think the demand for Yuen is declining with the demand for Chinese products. Chinese products have become synonymous with junk. The millennials have a word for it, they call it Chinesium. They said that about Japanese products post WWII, in my youth, in the 1950-s when I grew up. It may have been true, but then the Japanese showed America what. One example, the first Subarus, and Subaru now. I am a careful and “thrifty” online shopper. I do not discriminate by country of origin but rather by “value”. Admittedly value is subjective, colored by my experience, my perceptions and my thrift. But since I buy everything online that I am able to, I have learned to get the best value. Higher quality / lower price. You said this, “Chinese products have become synonymous with junk.” That is simply not true. I buy as much junk from one country as from another. In the last 10 and 20 years Chinese products have improved in the same way Japanese products improved post the 1950-s. I can prove it, but this is not the place for a debate such as that. The foreign goods purchased by the average American housewife dictate international trade and reserves. You may think that China’s quality is improving but I don’t agree at all. I especially avoid any luxury brand made in China and stopped subscribing to fashion magazines because of all the Chinese overpriced crap. I think that the changing attitude of consumers towards Chinese products has everything to do with CBs holding Yuan. Debate away! Over drinks and appetizers — some night — at Flamingo’s perhaps. I am old and maybe a bit tired too. More to the point, I have the typing skills of may Seniors my age — by which I am saying none at all. ( If we could only deep-six the QWERTY keyboard ! ) Typing is very hard for me, and wearying to do. Someday I will get a computer with a nice voice interface, and use my typing only as a final polishing step. Debating over a keyboard link is impossibly hard for me, so we’ll leave it at that unless I see you at Flamingo’s in 2018. Live long and prosper, you are one of the really good ones here. The problem is far more nuanced than mere perceived quality. Just to give an example the garnment industry has been wanting out of China for quite some time because textile worker wages have increased so much. Just to give an example around 2005 a textile worker in Dongguan, a huge textile center in the Pearl River Delta, was paid around $200. Now the same worker is paid $550/month. Even inner provinces have seen wages grow, a lot: textile workers in the Hunan Province, where labor is cheaper than in the neighboring megacity of Chongqing and considered “cheap” by Chinese standards, are paid $400/month. That’s why garnment manufacturers have been moving to places such as Bangladesh and Cambodia: in the latter place garnment workers are paid a government mandated wage of $153/month. The problem is, however, Bangladesh and Cambodia lack both China’s infrastructures and her well developed garnment industry, which is able to provide quickly and cheaply dyes, zippers, fabrics etc. Even more critically, the Chinese industry has an amazing capability for going from prototype to full production in an astonishingly short time, time being something the fashion industry needs even more than cheap labor. To remain competitive, Chinese manufacturers have become the undisputed masters at “quality fade”, meaning all the problems commonly associated with “China junk”, such fabrics which are more (poor) synthetic fibers than cotton, cheap dyes that fade extremely quickly, buttons that break after a season of use and so on. One also needs to understand Westerners companies are fully aware of what their Chinese contractors do, from quality fade down to illegally cloning their products, but this is all part of the cost of staying in business. China is what has allowed overstretched consumers all over the world to deal with stagnating and contracting real wages by savagely slashing the price of consumer goods, no matter the cost: our politicians and bureaucrats could have never pulled off their creeping debasement act if China had not become the “Factory of the World”. Most revolution start when people cannot afford to buy “stuff”. As usual the problem seems to be truly complicated. The scale of foreign-exchange currency reserves held by some countries truly defies belief. Just to give an example at the end of 2017 China’s own reserves went for the first time since 2011 under US$3 trillion, and China is widely believed to hold only four currencies (US dollar, euro, yen and British pound): the exact composition of said reserves is considered a State secret. You simply cannot flip those reserves around quickly, even if you are ready to cause severe disruptions in currency markets: I suspect the problem of scales has not been sufficiently appreciated by many. To this it must be added the People’s Bank of China (PBOC) has a radically different attitude from most central banks worldwide. The PBOC talks little (relative to the Fed and ECB) and tends to act without warning, taking their decisions behind closed doors. See their 2015 decision to devalue the yuan by 3% in a single day: the Fed and the ECB would have announced it months if not over a year in advance, then proceeded by baby steps, all the while soothing frayed nerves. This “unpredictability” is what makes central banks worldwide wary of the PBOC, albeit they have to grudgingly concede Chinese monetary policies are effectively making their jobs a whole lot easier and safer. Finally, there’s another problem of scale. From 2005 to August 2015, when the aforementioned devaluation took place, the yuan had gained a massive 33% against the US dollar. In 2017 the yuan again gained another not too shabby 7% on the US dollar. We can argue a lot on the matter, but the matter of fact is the US dollar is getting progressively weaker. It’s a long and slow process which somehow resembles what historians and numismatists call “creeping debasement” and which is so well exemplified by Byzantine coins of the X and XI century. The US dollar has long been a much favored reserve currency because it’s the one eyed king in the land of the blind but it seems like over two decades of truly gargantuan excesses in all fields have sapped its strength. This may be a momentary weakness, like the one suffered by the Byzantine nomisma before it was recoined by the Komnenoi, or it may be a long and drawn out slide into oblivion like the one which befell the Spanish silver dollar. Who knows? The global bankster cartel has a virtual lock on all the world’s currencies, the basis for their comprehensive wealth extraction. It’s what they do. If they may have neglected to optimize wealth extraction on one of the miscellaneous currencies it is only because they’re busy gorging on the entrees and simply haven’t gotten around to it. And if the dollar, for example, may seem to be a bit awry it is only because they haven’t let on to their strategy of profitable manipulation. For everybody else, the relative value of various currencies is the least of your problems. Great post ! It’s true about the international banking cartel, all the way back to 1694 or so. Absolutely ! For everyone else not directly involved in international trade, in their private life or professional life, which is to say MOST OF US, it is not a problem at all. If one defines wealth according to what he creates in his own life (“marching to the beat of his own drum” – Henry David Thoreau) pecuniary wealth is not important. That is the big picture. The wealth movement between geographies is subject to constant ebb and flow. The wealth movements to the global 1%, on the other hand, have flowed continuously in one direction as a result of a rigged system. This is the great imbalance of our time that greatly impedes productivity and societal harmony. When you work hard, but someone else steals the fruits of your labor, it’s a damaging circumstance. Greed is good. Cronyism and rigging are bad. If the dollar is going to devalue then you have to own more of it to buy the same amount of goods and services. Ambrose, with the amount of private and corporate debt, wouldn’t any significant devaluation of the dollar make repayment of this huge amount of debt a crisis? I mean, wouldn’t the rising prices reduce disposable incomes, unless wages and corporate incomes rose dramatically and in correlation with the rising prices.. And when has that ever happened? no, any time a sovereign offers a steep premium in bond yield its done with the caveat that the currency the bond is denominated in, will be devalued. LTCM. should the US be forced to offer higher rates to float the stimulus package (i don’t think thats the case) the drop in the dollar (which is the presidents policy) is a given. the next round of competitive devaluation comes round to America. corporates are (or will be) doing more business offshore, so the tax cut is a ruse, but America has become a tax shelter for multinationals. at some point China will say no mas to holding UST as reserves. that’s the downside, because those cusips are what gets us over the debt ceiling obstacles. at some point the GOP will slash government services, oh gee there’s no money. the beast is starved. Ok but first, does this sovereign actually control interest rates? Offer a steep premium? Aren’t interest rates actually controlled by the market. Even though in the last decade or so the CBs have truly manipulated the markets. They aren’t actually the sovereigns. They are private entities that believe they are protecting their own interests with their manipulations.. which in the short run has benefited the sovereigns. Long term we’ll see how this works out.. Besides isn’t RISK at real factor in interest rates? I mean in the long view. Risk and inflation (which is not rising prices but a debasement of currency). So haven’t interest rates been held low artificially? For a long time.. Which means that some issues concerning currencies have been distorted and or hidden. Thus raising the risk? And aren’t there are lots of factors that can change. The more time risk is not properly valued most likely means that it is rising. Even though that may not be apparent yet.. So when Mr Market decides that it is going to deal with the risk that has built up in the system or when all the hidden unaccounted for risk starts to show itself up in defaults or when those needing to borrow find that there isn’t enough actual cash around to borrow, then interest rates will rise. Unless the CBs are willing to absorb again.. increase their balance sheets to the moon? As to cutting spending… The US economy is 70% consumer spending and the money the government spends on services actually goes directly into the economy on the lowest end where virtually all of it is spent.. Wouldn’t cutting spending depress the velocity of money even further and exacerbate the problems? Thus slow the economy even further, lowering corporate incomes and lower tax collection? Wouldn’t that make it even harder for the government to borrow and force interest rates even higher? The dollar is the cleanest dirty shirt in the hamper for now, and is likely to be so for a long time. Back in the 70’s I was also thinking the same thing. Back then, inflation was eroding the dollar, and I was buying gold, silver,bullets, and copper. Pennies were 95% copper, and I bought dozens of $50 dollar boxes of new pennies from the bank. At the time it made perfect sense, now it looks silly. I am reminded of this when I occasionally bring a box of 1979 pennies to the bank. I would have been better off buying a few hundred shares of Coca Cola, and not worrying about trying to predict the future or the demise of the dollar. I find it amusing that people are now advocating what I did back in the 70’s. I guess it will be a learning opportunity for the next generation as well. Thanks for the story! I will avoid pennies, they do not make cents..( sense) Lol. You are a great public servant.. You add much clarity to this complex world we live in.. Thank you for all your hard work and insight! Reserve currency is akin to a prize for the biggest thug. Thugs don’t give away their bullying power for free. The US had the chance after the Cold War to reorganize the international financial system i.e. perhaps go back to a Gold standard or at least the SDR, but nah, once you get addicted to the power of printing money, why bother? The reserve currency status will go away on its own once the military is exposed for being just ordinary. I mean what do you expect from a force that’s been in Afghanistan and Iraq for so many years? Extreme profitability. They’re still there because (1) war is hugely profitable to politically-connected corporations, and (2) to advance profit-motivated corporate geopolitical interests. Hardly. The global bankster cartel has run US policies on such matters since Jefferson, except for a few years during the 1930s. That’s why Dubya and Obama gave them complete immunity for defrauding the country, ruining millions of Americans, crashing the global economy, and setting up the next phase toward global corporate hegemony, fawning and genuflecting to the FIC at every opportunity. Nobody in the Beltway expected them to do anything else, as the US political class takes it very much for granted. The central role of most national governments, including that of the US, is to implement the competing policies of corporatists and to sell those policies to the general population with sufficient deceit to get reelected. US social and political mores are being reordered accordingly on an aggressive schedule and your masters barely bother with pretences any more. The dollar’s illusory “strength” is due to the sad fact it has the most fingers left in the central bankers’ leper colony of debauched currencies. Meanwhile, the oligarchy’s looting and asset-stripping of what’s left of the productive economy is accelerating as the host gets closer to succumbing to its parasites. Ambrose the Great notes in his recent (17SEP17) Telegraph article that $USD debt is now 25T or 33% of global GDP. It includes 11T of outright debt and the newly “discovered” BIS calculation of 14T of swaps and off balance sheet dollar “shorts”. That is a lot of tugging on the remaining fingers. To his credit, Jeffery Snider has been beating the “dollar short” Eurodollar drum for some years now. And he notes that with QT – quantitative tightening – dollars will be less available globably. This is a huge swing from 40 years ago when Carter offered “Carter bonds” denominated in DeutschMarks and Swiss Francs, as the dollar was out of favor. So no, the dollar shows no signs of impending death, rather all other lepers are badly in need of urgent fiscal care. – I expect the USD to get stronger in the (near) future, instead of getting weaker. But a stronger USD is the worst that can happen to the world. – We saw that e.g. South America in the 1st half of the 1980s and the 2nd half of the 1990s get into trouble. Reason ? Rising USD !! May I add to the New Year greetings and also say thank you Wolf for the excellent website and the intelligent discussion that goes on here from the participants. May 2018 be blessed to all. Considering they will just get more and more used for everything in at least the next ten years and the name says it, does any country has reserves in rare metals? That seems a logical step, to have at least between 3% and 5% reserves in something that is so valuable but doesn’t have gold infamous long term stability. And yes that’s something that seems as sure as a middle term investment as something can be nowadays. Then again the smart phone market is close to saturation and any grow in use of rare metals will simply be because they are getting more and more used. Big countries like the US really should start to recycle most cell phones to reuse the rare mentals and not so rare metals in them. Any time a country starts to do that in big enough quantities the rare metal stocks will go down. Only to go up “slightly” if any new device that uses rare metals (aka most modern tech ones) sells like hotcakes. Hey Wolf any chance we will get a report on how stuff like the Nintendo Switch sales going better than expected afected the rare metals market or something? Not that I am in any hurry. hi Wolf and commenter s. Nobody has mentioned the fact that China supposedly is offering to buy oil for yuan that are fully exchangeable for gold in Shanghai and Hong Kong.. if it happens it will make a difference but maybe reserve currencies will be irrelevant then. Almost any currency is exchangeable for Gold, in Shanghai and Hong Kong. The price of that Gold is not in the buyers favour, and the CNY/AU rate is not fixed, as it should be, if CNY. Was a Gold based reserve currency. This is more of the CNY is AU based. CNY is replacing $ US, BS. Meanwhile, gold is surging as the supposedly strong dollar doesn’t change the fact that a larcenous private banking cartel is controlling our money issuance. – You should blame rising prices for the increase of credit. How about Munchins I mean Munchkins? Many countries chose to maintain significant export capacity, China, Germany, Japan South Korea for example, to keep employment and standards of living high. They need a customer for this productive capacity and the US fills this roll. They provide goods in exchange for paper. The paper in question, US dollars, US denominated bonds and equities have generally recognized value as mediums of exchange, collateral and a source of funding from so called Euro dollar banks as well as filling reserve and portfolio requirements. The price of this paper is high as the whole world has a demand for it. The high price severely limits the tradable goods sector in the US. It also encourages fiscal excess in the US, an aggressive foreign policy funded by bond issuance and other imbalances. This will probably go on as long as countries need to export and there is a country willing and able to incur the costs of the privilege of being the reserve currency. There is a concern the large import capacity of China and the Euro Bloc may threaten this dominance. However the lack of yield, limited capacity for investment returns and export surpluses of these entities limit the competitiveness of these options. The price paid to be the reserve currency is high domestically and that burden cannot easily be taken up.